Reunion Island - Island Reserve (Medium Roast). 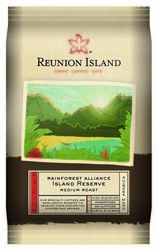 Reunion Island's signature medium roast blend features beans from Nicaragua, Peru and Tanzania which when combined present a balanced cup full of nuanced characteristics. The blend maintains individual characteristics of tropical fruit, winey, toasted almonds and caramel. This coffee is a Rainforest Alliance Certified Coffee. A balanced coffee with the flavors of tropical fruit, winey, toasted almonds and caramel. Each case contains 24 bags of 2 oz coffee.